Lodge Cottrell have completed the development of their new modular fabric filter. 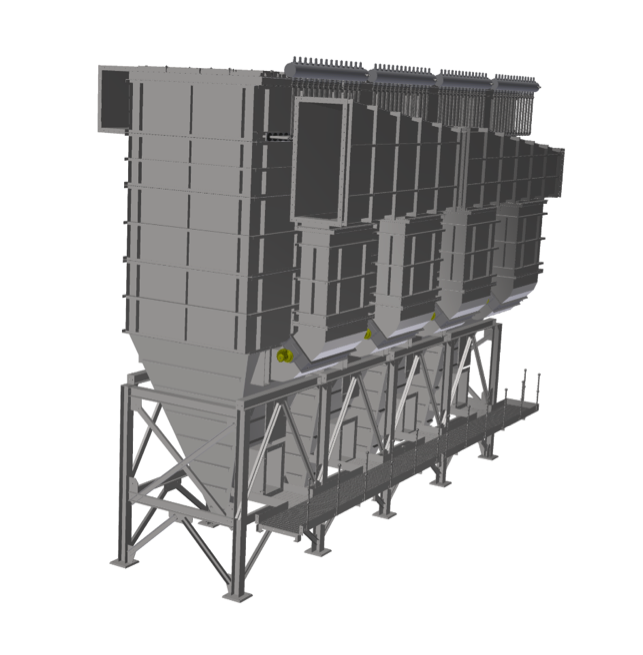 It has largely been developed for the Biomass/Waste to energy market in Europe where each of the workshop assembled modules can be delivered to site via road fully insulated and clad. The modules of the fabric filter will then be lowered into position on-site on the pre-assembled support structure. Site construction has been a key consideration when designing this new filter, with the aim to reduce erection time and specialist supervision. The design uses a common wall principle that optimises steel weight of the overall filter, reduces foot print of the construction and provide structural benefits as the whole assembly is held together as one rather than serveral separate units. The common wall has an insulatable design for use if the operator requires the option of online maintenance of the “dirty” side of the fabric filter. Each fabric filter is sized to suit the process condition and is drawn using 3D software, thus providing the benefits that is available with this technology. i.e an accurate calculation of weights, generation of a Bill of Materials and a 3D General Arrangement model that can be used within the overall plant layouts. During the design process, we have completed CFD analysis of many configurations to ensure equal gas flow balancing between modules and uniform gas distribution within each chamber. Further CFD analyses can be completed on a project by project basis. The design includes various internal and external access options to suit the operators’ requirements and budget.